When it comes to securing your property, there are only a few viable options available. You could spend thousands on a top of the range CCTV and alarm system, or you could simply purchase some specialist gates and have them installed by one of the foremost experts in this field. Though most people don’t realize it, gates can act as a major deterrent, and so you should start looking into this solution today. Here at Tulsa Home Guard, we specialize in the manufacture, installation and maintenance of gate systems for private residences, so you’ve come to the right place. The service we provide is second to none, and all the products we sell are made to the highest possible quality. We take pride in our work, and never leave a single client unsatisfied with the job we perform. There are many security benefits to having a gate system installed at your property, but we feel home privacy is also one of the main reasons we’ve been so successful. Through the use of our products, you can ensure no wandering eyes ever catch a glimpse of anything you don’t want them to see. 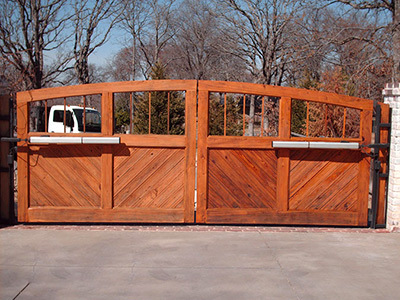 Tulsa Home Guard is one of the most respected and highly acclaimed gate specialists in the US. With a strong emphasis on customer service, they’re always willing to answer any questions you might have about their products or processes, so don’t hesitate to call us at (918) 584-4923 today. We look forward to hearing from you!